Delays in the confirmation of Czech Commissioner-designate V?ra Jourová are caused more by parliamentary infighting, and her nationality, than by her performance yesterday (1 October) in the European Parliament, Czech MEPs said. EURACTIV Czech Republic reports. After more than three hours of grilling, the Czech Commissioner-designate for Justice, Consumers and Gender Equality, V?ra Jourová, seemed exhausted. “I am sorry, I am so confused that I forgot to pull out my paper with the final speech,” she said before her final remarks. Although Czech MEPs contacted by EURACTIV Czech Republic have admitted that Jourová’s performance was at times unconvincing, they don’t think she failed the test. According to the Czechs, the reason to postpone the decision about Jourová has been driven more by jockeying in the European Parliament, than by her actual performance. “It has played a major role, especially in the S&D,” said Pavel Teli?ka (ALDE). “They have exploited some unsatisfactory moments to form the line of defence for their candidates, especially for Pierre Moscovici,” argued Teli?ka. That explanation is shared by the chair of the legal affairs committee Pavel Svoboda (EPP). “Moscovici is the co-author of the current French financial problems. It brings a lot of uneasiness that he could transfer his expertise to the European level.” Regarding the performance of Jourová, Svoboda stated it was better than he expected, especially considering the diversity of her portfolio. The same argument is shared by Tomáš Zdechovský (EPP) from the LIBE committee, which will be crucial to determine Jourová’s fate. According to Zdechovský, opposition in the committee originated not only from Socialists, but also from the Greens and part of the EPP. “I told my colleagues in the committee to imagine they would have to prepare for energy portfolio in ten days,” said Zdechovský, referring to assignment of portfolio which was not favoured by Jourová. But he also points out the importance of political game between the political groups. According to Zdechovský, some liberal MEPs were very critical to the EPP, and the group is more prone to fire back. Although Jourová’s hearing was not the most heated, there were some biting questions, especially from Italian MEP Laura Ferrara (EFD). She accused Jourová of providing misleading information regarding the leader of her party ANO Andrej Babiš. The Czech Deputy Minister, and the Minister of Finance, still owns the important food company Agrofert and the publishing house Mafra, which publishes the most widely-read Czech newspaper, Mladá fronta DNES. She stated in the past that he will liquidate his business, which has not happened. “I said what I knew about the issue. He had a successful business career and I did not take any interest in that,“ responded Jourová. That answer was heavily criticized by Czech commentators. 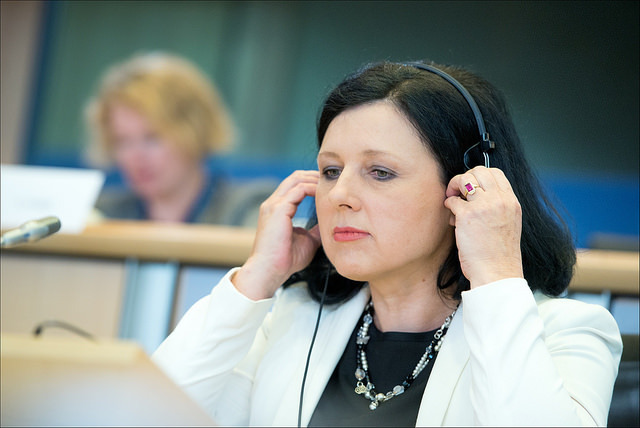 Polish MEP Tadeusz Zwiefky swiftly asked her about her position on the regulation of small and medium enterprises. Jourová took a stand for the improving the legal structure, simplifying the setting up of new firms, and lowering the cost of cross-border trade. The Czech Republic has been dealing with the Roma issue, and the Committee did not miss the chance to put the question to the Commissioner-designate. “Inclusion of Roma is a longstanding cause for concern. Various government institutions need to take part in finding a solution. I worked on similar project at the local level myself,“ Jourová stated. “I would like to thank you for such pleasant atmosphere which I didn‘t expect,“ concluded the Czech nominee. “You cannot go into details in two minutes. I expressed my own views. In some cases I wasn’t fully aware of a few details, but I did attempt to be as concrete as possible.” Apparently, that apology was not sufficient for everyone in the room. Jean-Claude Juncker, the new President of the European Commission, announced the distribution of portfolios among his new team on 10 September. Among the new Commissioners, due to take up their posts on 1 November, are 18 former (prime) ministers. The President has announced that the new Commission will be "very political". The new Commission must now be approved by the European Parliament, who will interview the Commissioners between 29 September and 7 October. During these two weeks of hearings, the 27 Commissioners will be interviewed by MEPs from relevant parliamentary commissions. The European Parliament must then accept or reject the whole team.